Most of this text is from ►Race Tech's Motorcycle Suspension Bible. To bring you up to speed, fork design has already been covered. This means this section does not require much explanation. There are 6 major oil damper shock absorbers in use today and many new and/or subtle variations on these types. This type of shock is the most popular style on the planet by a long shot (see figure 3.33). If you look closely you can see it looks very similar to a standard cartridge fork, with the shock shaft the equivalent of the damping rod. On the end of the shock shaft is a rebound piston with a check valve on the top side. There is a “base valve” (compression valve) at the bottom of the cartridge with a check valve on the top side. Outside the cartridge is a compressible air space to deal with the displacement of the shock shaft. These shocks must be mounted in the orientation shown and cannot be inverted. There are subtle variations, like the addition of a Freon bag inside the outer chamber instead of letting the air contact the oil directly. Contrary to what you might think, the use of Freon as a gas has nothing to do with cooling the shock. This variation had limited improvement. There are also designs that feature a floating piston ring that seals on the outer diameter of the cartridge tube and the inner diameter of the shock body, allowing the shock to be pressurized through an opening in the seal head. This is done in an effort to control cavitation and allows the shock to be mounted in any direction. These are not generally considered to be "high-performance". Emulsion shocks are single tube shocks that have no reservoir and are not quite full of oil because they require an air space to deal with the displacement of the shock shaft. They must be mounted in the orientation shown, with the body up and the shock shaft down. The compression valving stack is on the bottom of the piston while the rebound stack is on the other side. These shocks are generally pressurized to raise the temperature and lower the pressure at which cavitation occurs within the suspension fluid itself. As you might imagine, the potential for cavitation and foaming is real—the idea behind the design is that once it “foams up,” it will become consistent. Emulsion shocks can actually work quite well but are not considered to be a high-performance design. 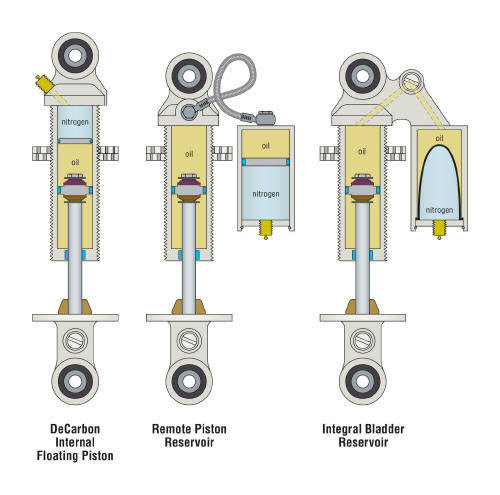 If we were to separate the oil from the nitrogen with a floating piston in the main shock body, we would have a basic DeCarbon reservoir shock. I group remote reservoirs, piggybacks, bladders, and diaphragm reservoirs into this group. All are high-performance designs. When the French scientist Dr. Christian Bourcier DeCarbon invented this design, he used a floating reservoir piston in the main shock body, but all the styles mentioned are variations of this theme. Externally DeCarbon’s original design looks like an emulsion shock but internally it’s quite different. By separating the oil from the air space then pressurizing this space with nitrogen, we can reduce or eliminate cavitation. 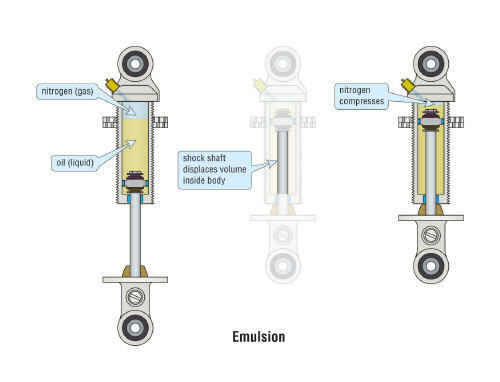 Remember that the amount of nitrogen pressure required is directly related to the amount of compression damping required—this was discussed in the pressurized fork section. Nitrogen is used in this design because it’s dry, inexpensive, inert, and easily acquired in high-pressure bottles, but it is not the only gas that can be used. One of the problems with the original DeCarbon (Internal Floating Piston or IFP) design for many motorcycle applications was that, because the floating piston was in the main shock tube, the shock was considerably longer than a twin-tube or emulsion shock. A solution to this was attaching a remote reservoir with a hose. Now this idea has evolved into an integral (piggyback) reservoir built into the body. The integral design not only simplified the design but it has the added benefit of a very short heat path to the added surface area of the reservoir body keeping the oil cooler. NOTE: These are the three types of G3-S Shocks available. IFP - Internal Floating Piston, Remote Reservoir, and Piggyback. ♦ The IFP does not have external compression adjustment. ♦ Remote Reservoir has Lo and Hi-Speed Compression adjustment. ♦ Piggyback Reservoir is the preferred design and has Lo and Hi-Speed Compression adjustment. A simple version of a through-shaft design is a linear steering damper, with compression valving on one side of the piston and rebound on the other. The shock is completely filled with oil. Generally speaking, there is no compressible air space required because the shock shaft volume going in is equal to the volume going out. However, it is preferable to have a compressible space to allow for expansion of the oil with temperature. This basic design is used in ►Race Tech G3-ST Softail Shocks.